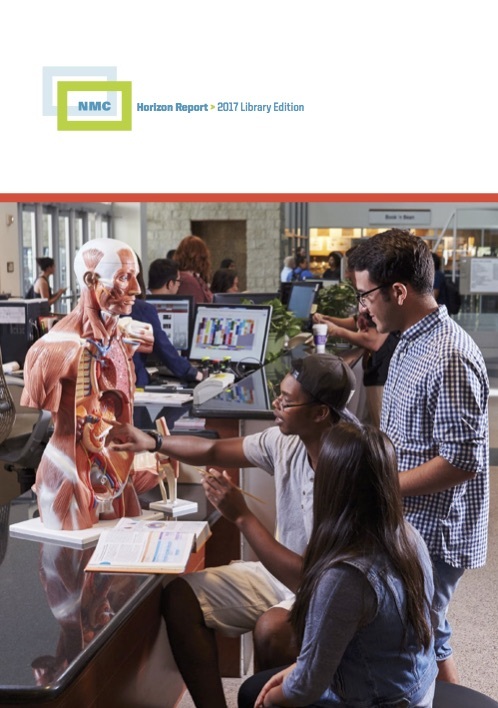 The research behind the NMC Horizon Report: 2017 Library Edition is a collaboration between The New Media Consortium (NMC), University of Applied Sciences (HTW) Chur, Technische Informationsbibliothek (TIB), and ETH Library. Their critical participation in the production of this report and their strong support for the NMC Horizon Project is gratefully acknowledged. Adams Becker, S., Cummins, M., Davis, A., Freeman, A., Giesinger Hall, C., Ananthanarayanan, V., Langley, K., and Wolfson, N. (2017). NMC Horizon Report: 2017 Library Edition. Austin, Texas: The New Media Consortium. Becker, S.A., Cummins, M., Davis, A., Freeman, A., Giesinger Hall, C., Ananthanarayanan, V., Langley, K. & Wolfson, N. (2017). NMC Horizon Report: 2017 Library Edition . Austin, Texas: The New Media Consortium. Retrieved April 23, 2019 from https://www.learntechlib.org/p/177969/.